London, 28 June, 2016 – ‘Ilvermorny School of Witchcraft and Wizardry,’ the second instalment in a collection of new original writing by J.K. Rowling entitled Magic in North America, will be published today exclusively on pottermore.com. 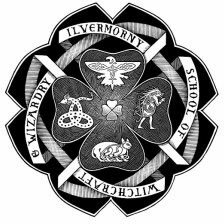 ‘Ilvermorny’ (Ill-ver-morn-ee’) provides a vivid and captivating backstory of the great North American school of magic, founded in the 17th century. The new writing, and the short video that accompanies it, provide a rich background for the upcoming Warner Bros. feature film Fantastic Beasts and Where to Find Them, which will be released 18 November, 2016. The film, which marks J.K. Rowling’s screenwriting debut, is an all-new adventure starring Eddie Redmayne as magizoologist Newt Scamander who arrives in New York in 1926. The work of fiction begins in Ireland where an orphaned young girl who is a descendant of Hogwarts co-founder Salazar Slytherin, escapes her evil aunt and sets sail on the Mayflower. Landing in Massachusetts with little more than the clothes on her back and a stolen wand, she ventures out on her own, wandering in the wilderness until she encounters several mysterious creatures and discovers she is not the only magical person in the New World. But she will also have to overcome great challenges and face new dangers on her way to establishing what will become the Ilvermorny School of Witchcraft and Wizardry at the peak of Mount Greylock in Massachusetts. In March, Pottermore published ‘History of Magic in North America,’ the first instalment of Magic in North America. The writing, which was posted over four consecutive days, took readers into the history of North American witches and wizards.